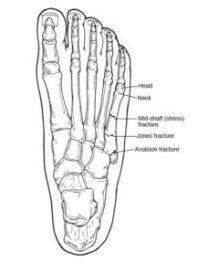 areas of the foot to determine where there is pain. The surgeon will also order x-rays. Because a Jones fracture sometimes does not show up on initial x-rays, additional imaging studies may be needed. bone stimulation. If surgery is required for treatment of a fifth metatarsal fracture, the foot and ankle surgeon will determine the type of procedure that is best suited to the individual patient.